Today it is not unusual for children to grow up in a home where their parents are from different cultures or religions. Due to attitudes about mixed marriages, ethnic backgrounds, or religions, some children who are born into these families experience difficulties from both inside and outside of the family. At the same time, many children grow up in these families to have a better understanding of diverse cultures and experience many wonderful things. One child that grew up in such an environment in the Bible was Timothy. 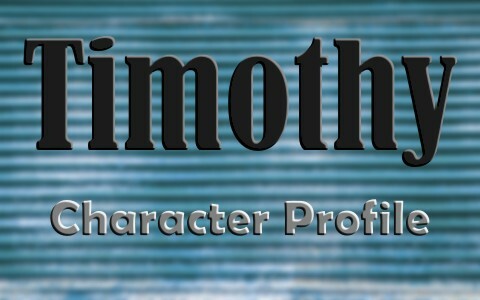 A short character profile of Timothy in the Bible will help us to see the potential for any child, no matter what their family circumstance, in doing great things for the Lord. Timothy grew up in the town of Lystra as the son of a Jewish woman named Eunice, who was a believer, and a Greek (Gentile) father who is not mentioned by name (Acts 16:1). Other than this brief mention of Timothy’s father, there is no other information about him so we have no idea if he was even a part of Timothy’s life growing up. This might also suggest that Timothy’s mother could have been a single mother or simply tasked with raising Timothy without the influence of his father. However, we do see that Timothy’s mother did have the help of her mother Lois, who was also a believer, in raising Timothy (2 Timothy 1:5). Timothy was not raised as a Jew as he was not circumcised until later as an adult by the Apostle Paul when Paul came to their area on his second missionary journey. Likewise, we know that Timothy’s mother and grandmother raised him to have a deep understanding of the Scriptures starting at an early age, which resulted in his salvation (Acts 16:3-5; 2 Timothy 1:1-14; 2 Timothy 3:14-15). Some people question why Paul had Timothy circumcised, especially after recently having a heated disagreement with Peter for not speaking out against circumcision when Peter was around other Jews. Likewise, Paul was directly involved in delivering a letter from the Apostles in Jerusalem that declared that circumcision was not necessary as a believer (Acts 15:1-7; Galatians 2:11-21). The answer to why Paul circumcised Timothy is found in Acts 16:3-4. Paul had Timothy circumcised because there were Jews there that knew Timothy’s father was not a Jew and Timothy was not raised as a Jew. Since he was not raised as a Jew, the local Jews would have nothing to do with Timothy because he was a Gentile. Therefore, Timothy allowed Paul to circumcise him so that he would be received by the local Jews as he worked alongside Paul. This is a living example of what Paul described in 1 Corinthians 9:19-23 about being all things to all men so that he might be able to more effectively preach the gospel message of salvation. The fact that Timothy allowed Paul to circumcise him so that he could more effectively witness to Jews is an amazing testimony of Timothy’s devotion and burden to share Christ with the Jews. After Timothy’s circumcision Paul had Timothy accompany him as he continued on his second missionary journey along with Silas (Acts 15:36-41). Along the way, Paul trained Timothy in the work of the ministry as it was prophetically revealed to Paul that Timothy should be ordained as an evangelist in the gospel ministry (1 Timothy 1:18-19; 1 Timothy 4:14; 2 Timothy 6; 2 Timothy 4:1-5). We see the extent of their travels together through many regions around the Mediterranean Sea as evidenced by the letters Luke, Paul, and Timothy sent to the believers they had befriended in Berea (Acts 17:15); Corinth (1 Corinthians 4:17; 2 Corinthians 1:19); Philippi (Philippians 1:1; Philippians 2:19); Colossae (Colossians 1:1); Thessalonica (1 Thessalonians 1:1; 1 Thessalonians 3:1-10; 2 Thessalonians 1:1) and Ephesus (1 Timothy 1:1-3) amongst other places. Paul wrote letters to Timothy, whom he had left there to address the heresy and ungodly living that had arisen (1 Timothy; 2 Timothy). Paul, as now the much older elder, addressed Timothy as his own “son in the faith” and charged him to battle as a minister for what was right (1 Timothy 2:2). Paul provided extensive theological encouragement to Timothy and told him to stand strong on the truth in the battle of spiritual warfare. He also sent instruction on a number of topics such as prayer, appropriate dress, the selection of bishops and deacons. In addition to these practical things, Paul told Timothy of how many would depart from the faith and how to conduct himself as a minister against the challenges of apostates. He also advised Timothy on how the church should conduct its affairs and the treatment of widows and elders. Paul then charged Timothy to preach the Word with fervor, conviction, and patience as the time was coming when the people would one day not listen to sound preaching, but seek ministers who will preach messages that do not convict or challenge them. Finally, Paul told Timothy that his time of departure from life on earth was coming to an end and asked Timothy to come to him and to bring some of his things. We do not hear anything more about the rest of Timothy’s life, but church historians write that Timothy remained in Ephesus the rest of his days. What can we learn from Timothy? If you follow the life of Timothy, you find that he was the kind of man that spent his whole life serving in ministry. In his early years, he lived the hard life that came along with going from town to town with Paul. However, we find that as he aged, he eventually became centrally located and set down roots so that he could invest in the lives of people of all ages. At the same time, Paul used the truth of his final years to teach Timothy an important point. That as believers, we need to direct our effort toward serving the Lord no matter where we come from or where we end up. Likewise, as Paul did with Timothy, we must make the effort to teach a new generation of servants and ministers. We must train up faithful men (and women) to take the things that they have learned and to teach others (2 Timothy 2:1-2). In doing so, the ministry will not die with us, but will multiply on through the lives of those we have taught. Timothy grew up in the town of Lystra as the son of a Jewish woman named Eunice, who was a believer, and a Greek (Gentile) father who is not mentioned by name. Timothy was raised as a Gentile and was spiritually adopted by the Apostle Paul. Timothy accompanied Paul throughout the Mediterranean Sea area where Timothy eventually became an ordained evangelistic minister. Eventually, Paul send Timothy to Ephesus where he remained for the rest of his days ministering to the people and training up faithful teachers to carry on the mission. Timothy serves as a living example of Paul’s admonition to be all things to all men so that we might be able to more effectively preach the gospel message of salvation. Finally, we learn that it does not matter where we come from, Godly influences, and Biblical teaching can overcome any disadvantage. Thank you! That was very interesting! ps) I read you already in my email and on Facebook.